The Fall of the Joseon Dynasty Began with Its Economy. September. 18, 2004 08:03. by Chae-Hyun	Kwon confetti@donga.com. Korean historians, who advocate a nationalistic positivism, are under siege from all directions. Scholars of Western history have declared an all-out war to dismantle national history, rallying around the slogan, Nationalism is a fiction. Scholars of Chinese literatures and social historians are digging trenches of micro-history, violently shaking the foundations of macro-history and its grand statements on politics and ideology. Economic historians are putting on their own pressure with their advocacy of quantitative history, a more strenuous version of the positivistic methodology that academic historians had once used to invalidate the claims of non-establishment historians. Viewing Late Joseon through the Lens of Quantitative History is a missile launched at the heart of nationalist historians by the proponents of economic history. Korean nationalist historians have been asserting that the seeds of capitalism had begun to sprout as early as the late Joseon Dynasty, in an attempt to refute Japans colonialist theory that Joseon society had long been mired in stasis. In opposition to the nationalist historians claims, scholars at the Naksungdae Institute of Economic Research (NIER), founded in 1987 by then-SNU professor Ahn Byeong-jik and Professor Lee Dae-geun of Sungkyunkwan University, argued that Koreas modernization properly began during the Japanese colonial era.  is the first concrete result of the new positivistic research undertaken by Professor Lee Young-hoon of SNU and his fellow academics, who make up the second generation of scholars at NIER. Over the past three years since August 2002, these economic historians have been working on a study of Koreas long-term economic statistics, with the sponsorship of the Korea Research Foundation. This book brings together nine papers from their first year of research, which compiles and analyzes statistics regarding Koreas population, wages, land value, prices, interest rates, and economic growth rates from 1650 to 1910. The genealogical records of upper-class (yangban) families, accounts of rice costs and interest rates, wages as set down in various record books, changes in land value as indicated in clan and local registers, etc. all contribute to the statistics that inform this collection. The papers conclude that the late Joseon economy enjoyed a period of stability or development in the 18th century, then fell into crisis in the succeeding century. The collection also brings attention to the anti-capitalistic character of Joseons economy. Until the end of the 19th century, commodities like horses, rice, and cloth were used as currency, and interest rates per year were as high as 30~40 percent, which would have posed a serious challenge to the accumulation of capital. 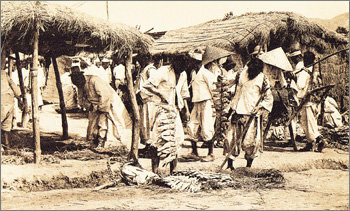 In addition, wages for poor, unskilled workers (called mogun) were higher than those earned by skilled workers (or jangin), and the governments hwan-gok system operated on a scale of 50 million bushels a year until the mid-18th century. Such evidence suggests that a non-market-based moral economy persisted strongly throughout most of the Joseon era. But, of course, numbers dont tell the entire story. The depletion of 19th century Joseon economy is already evidenced by the numerous riots and uprisings that plagued society at the time. Moreover, economic crisis does not always signify the depletion of the internal potential to overcome it. Even Britain experienced extreme wage drops and the devastation of its agricultural economy during the first stages of industrialization. Japan also faced the challenges of falling agricultural productivity and severe inflation around the time it opened its doors to Western trade. In this context, we may well expect a counter-response from other quarters of Korean historical scholarship.